Winston Salem is a flourishing entrepreneurial community with exciting new businesses starting every day. We’re in Forbes magazine’s Best Places for Business and Careers, and part of that strength is our strong local pride. Our local business ecosystem is full of entrepreneurs supporting each other in growth and development. And when those entrepreneurs need beautiful, responsive, custom-designed websites, they know exactly the company to call. Trust your local business community; conversionMOXY offers the website design Winston Salem business owners love. eCommerce Expertise: Payments, shipping, and security are mission-critical for any business — so you need to know they’re in good hands. We’re seasoned eCommerce professionals with in-depth knowledge on payment systems, P.O.S. management, and more. Mobile Responsive Design: Today, if your site has a clunky mobile interface, you might as well be stuck in the 90s. At conversionMOXY, we design each website to be fully functional and look great on every mobile device. SEO Creativity: Your business can live and die based on search engine rankings. That’s why conversionMOXY optimizes each website we build with in-depth SEO research and high-quality tailored content. ROI Focused: We carefully calculate every aspect of our web design to produce maximum ROI for our clients. We meet regularly with all clients to review results. Each month, we plan strategies to ensure they’re getting a return on every dollar spent. 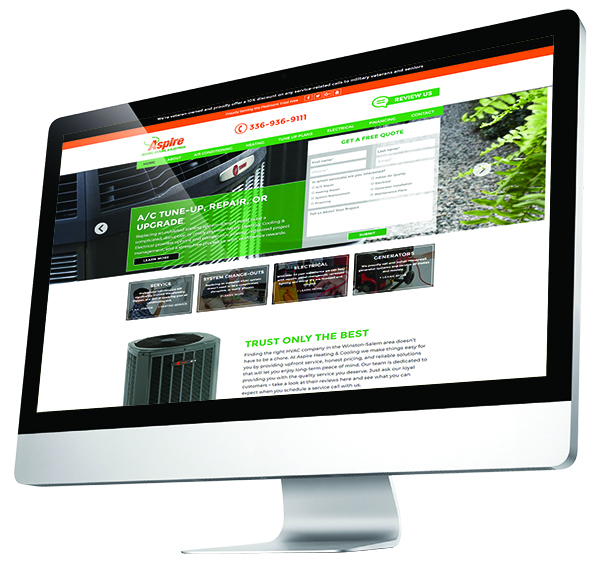 Aspire Heating, Cooling & Electrical: Rapidly expanding Triad HVAC firm Aspire Heating, Cooling & Electrical hired us to create their new site. Their streamlined new website highlights their wide range of services & fills their sales funnel through special promotions. We’ve worked closely with Aspire to give them an advantage in a competitive industry via a sleek, high-performance website. Blue Lagoons: A beautiful new website has helped custom pool company Blue Lagoons grow into a top player in their industry. Buying a custom pool is a big-time investment, and a website of gorgeous photos provides a big sales boost! Kernersville Auto Center: Kernersville Auto Center has been a local mainstay for years. But we didn’t just give their site a new coat of paint — we put a whole new engine in it! Their new site highlights their many state-of-the-art amenities, including their Xpress Turbo Wash car wash system. At conversionMOXY, we’re proud to create the website design Winston Salem business owners use to succeed! Call us at 336-814-9421 for a free quote or use our contact form. Once you see what we can do for you, we think you’ll agree that it’s good to keep it local.